With support from The John R. Oishei Foundation and other funders, and the engagement of more than 200 cultural tourism stakeholders, the Regional Institute developed a long-term strategic plan for cultural tourism development in Buffalo Niagara. The plan was released in 2005, with the initiative now in the implementation phase. 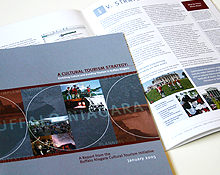 The first phase of the effort included an inventory of cultural tourism initiatives and plans in the Buffalo Niagara region.